Armed with slingshots, bows, arrows and knives, traditional hunters in West Bengal killed nearly 5,000 wild animals in four days. This shocking report comes from a statement made by a Kolkata-based organisation and Sanctuary Asia magazine. According to the sources, these killings took place over 3-6 June on the account of 'Jyeshtha Amavasya' or new moon in the state's East Midnapore district. The hunters were intercepted by People United for Better Living in Calcutta (PUBLIC), an NGO, and the state forest department at various railway stations between Howrah and Kharagpur as they were taking back the hunt. 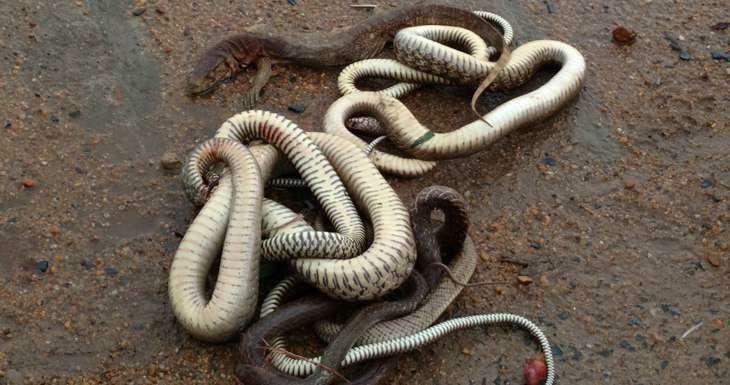 Remains of 28 wild animals were found on the hunters, including four species that have been given the highest level of protection under law - the Bengal monitor lizard, Water monitor lizard, Golden monitor lizard and fishing cat. Other species found include golden jackals, jungle cat, common palm civet, flame-backed woodpecker, white-throated kingfisher, etc. 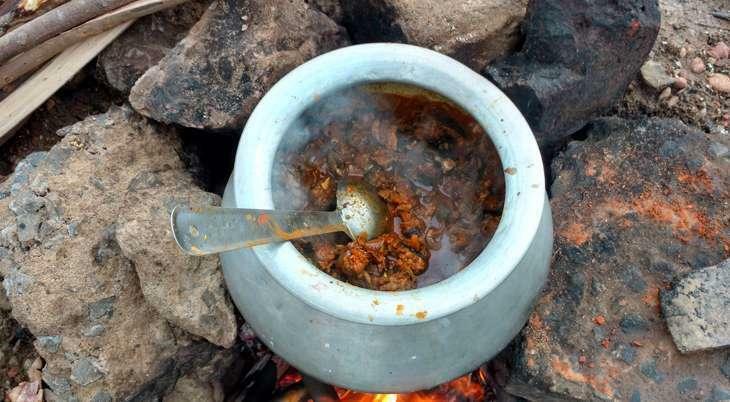 The hunters were also found cooking some of the meat on railway stations. PUBLIC said that thousands of hunters entered the forests for the hunting festival. On their way back they were intercepted at various locations by the state forest department and by the organisation's members. Five groups were intercepted at Panskura and Khirai in East Midnapore, while others were caught at Deulti and Bagnan in Howrah district. 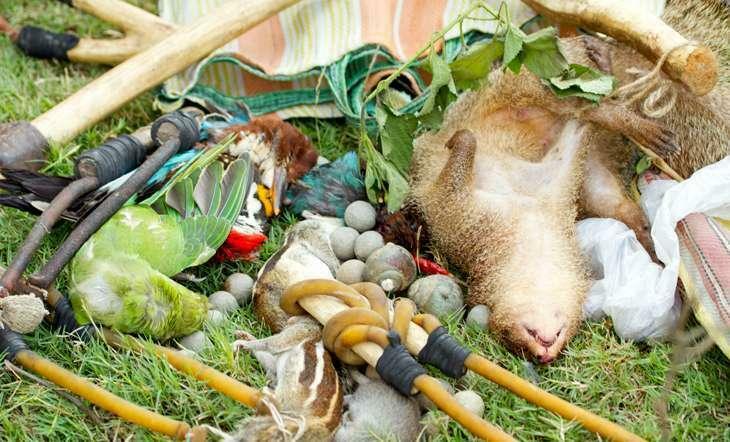 Forest authorities released the animals that were still alive and confiscated the remaining carcases. PUBLIC said that other such hunting festivals are celebrated in April and May, but these can be clamped down with cooperation from the railways. But such a large-scale hunt has never been intercepted before. 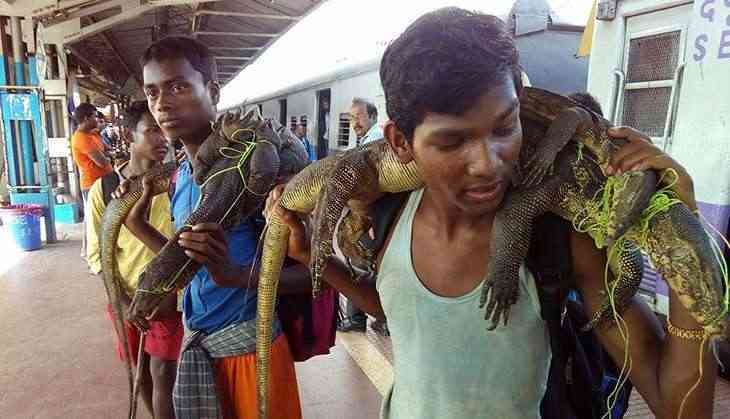 This time, the organisation alleges that railway authorities turned a blind eye to the wild animals, some alive, openly visible on Panskura railway station on 5 June. Some of them were even being cooked at the platform on open stoves. "On a day when the Eastern Railway ran press advertisements about World Environment Day, the Railway Protection Force stood and watched Bengal's biodiversity being decimated... the railway police instead of helping us, accused us of creating trouble," PUBLIC's Meghna Banerjee said in a statement. "If railway authorities choose to work in tandem with the forest department, in-roads can be made towards stopping the massacre and educating these hunters about the importance of biodiversity and the laws of the land," the statement said. "It is unfortunate to see that the forest department, police and railway authorities do not coordinate with each other to stop such dangerous activities despite many efforts to bring them onto a common platform through training and workshops," said Shekhar Niraj, head of TRAFFIC India, an organisation that works to curb illegal trafficking of wildlife. "Such failures are a sign of a weak national policy on wildlife enforcement, poorer implementation, and a reflection of complete insensitivity to wildlife protection in India," Niraj added. "Traditionally, hunting was once an integral part of many Indian tribal cultures. However, given the scale of the East Midnapore wildlife massacre and the anthropogenic pressures already exerted on the forests of the country, it is no longer sustainable," Bittu Sahgal, editor, Sanctuary Asiamagazine, said. None of the hunters have been arrested so far. Also Read: Incredible India: Wild boars are no fans of Yo Yo Honey Singh's songs! Also Read: Have you been buying animals on OLX ? If yes, then beware!